Although I don’t travel very often or very far, and I have never gone on any kind of “book buying trip,” I am definitely a happier traveller when I am able to steal time from the “real” purpose of any trip I might take to visit a few stores that sell used books. Last Friday, for instance, my wife, our son, and I drove from Regina to Calgary, via Saskatoon, to attend a wedding, and over the next few days, return trip included, I managed to spend a couple of hurried hours browsing through a thrift shop and four different bookstores… although, unfortunately for me, only three of the four sold used books that I could afford. The fourth — which is actually the store in Calgary that I visited first, and only because it was located near a comics and Magic card shop that our son wanted to visit — was clearly designed to appeal to upper-middle-class bibliophiles with discerning taste and deep pockets, i.e., not me. I was fairly happy with both the selection of books and the prices at the two “Fair’s Fair” used bookstores we visited in Calgary, however, and very happy with the selection and prices at the store that we stopped at, briefly, in Saskatoon on the return trip. 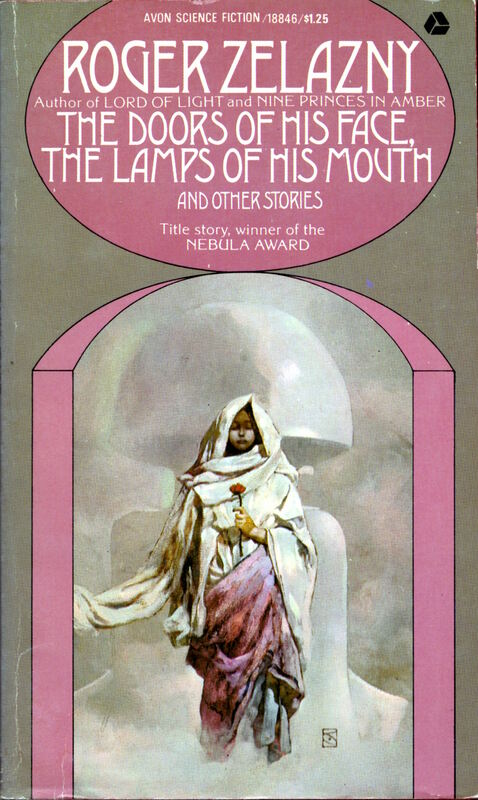 Keywords: The Doors of His Face, the Lamps of His Mouth and Other Stories by Roger Zelazny, Jeffrey Jones. 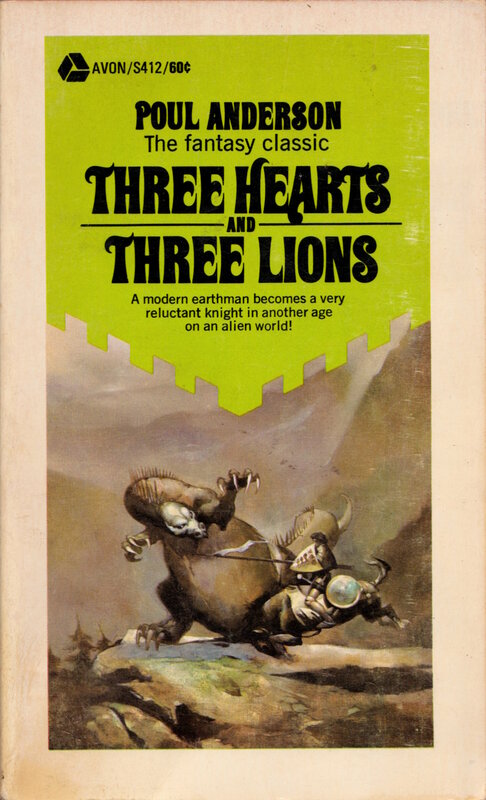 Keywords: Three Hearts and Three Lions. A few months ago, I picked up a couple of “bales” of National Lampoon Magazine — thirty-two issues, in all — from a local bookseller for cheap. 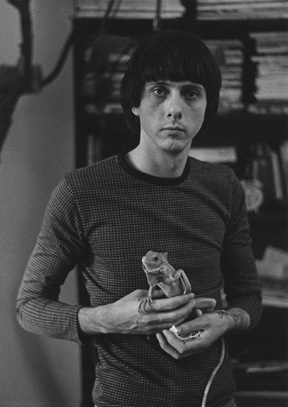 It was only when I got home with my bales and cut the strings that I found out that all but one of the issues were from the 1980s and 1990s, which was okay because, at the very least, it gave me quite a few terrific comic strips by M. K. Brown, R. Crumb, Shary Flenniken, Rick Geary, Buddy Hickerson, Mark Marek, Rodrigues, Gahan Wilson, et al., to read. The lone exception, however, was an issue from November 1975, which — o lucky me! 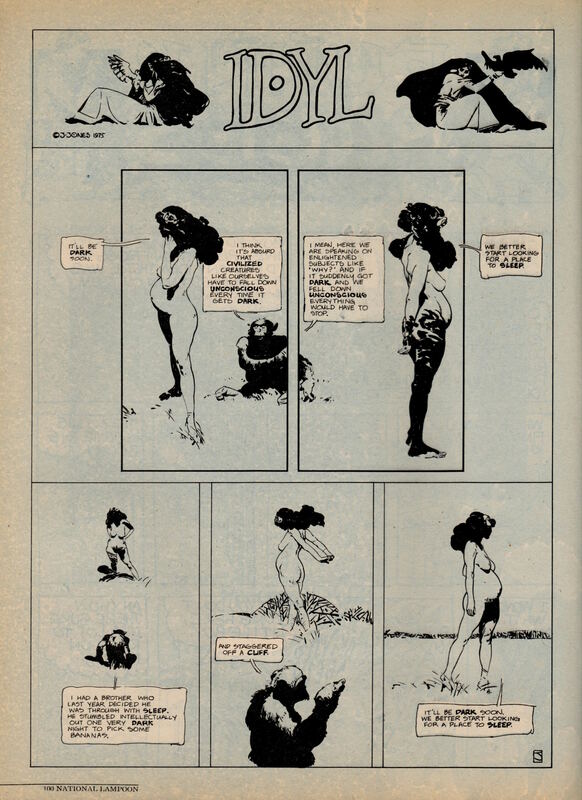 — includes the second-last Idyl strip by Jeffrey Jones that ever appeared in the magazine. Don’t delay! The donation deadline is Thursday 28 February 11:59PM PT. A more traditional film-promo t-shirt is also available. See the home page of the Better Things Indiegogo site for pictures. 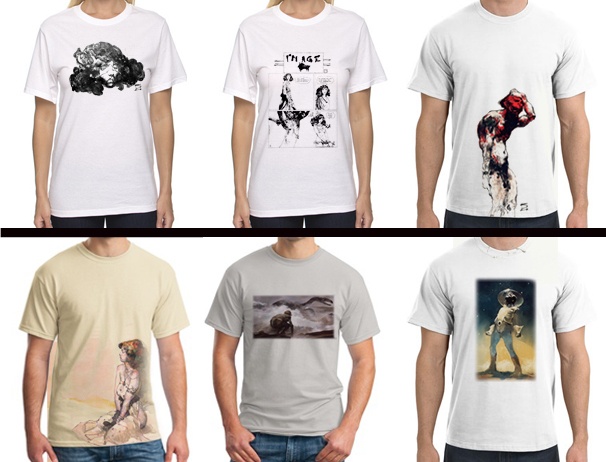 Now, the price may seem a bit high for a mere t-shirt, but keep mind that the main point here is to support a film about an artist whose work you love, not outfit the kids for school — although there are definitely kids (as well as adults) out there who would love one of those t-shirts! Rather, the t-shirts and other merchandise are merely Maria’s way of thanking you for your donation. 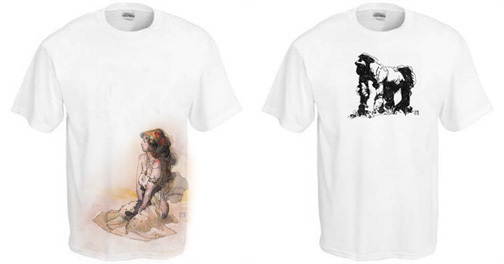 And where else are you going to get a t-shirt with art by Jeffrey Jones on it, anyway? Nowhere, that’s where! Colour and size options for the t-shirts are listed on the site, but if you don’t see a colour you like or the size you need, simply ask Maria about other options. Keep in mind, however, that Maria has recommended neutrally coloured fabrics (and white) because they work best for the full-colour artwork, which a commercial printing company will reproduce on the t-shirts by “ink transfer.” The images are not decals or iron-ons, which sit on the surface of the fabric and tend to flake away over time; rather, “the ink is transferred and is absorbed by the shirt and is completely washable and blends well after several washings.” Of course, the designs that feature Jones drawings in black ink — the “I’m Age” strip or the gorilla, for instance — would look great on a t-shirt of almost any colour. But, again, ask Maria about your options. You can contact her via the Indiegogo site or her twitter feed. So visit the Better Things Indiegogo home page and donate today! Please note that the Better Things fundraiser is a “flexible funding campaign,” so all of the money raised goes to the film — and everyone who donates will receive their chosen perks/rewards — regardless of the total amount of money raised by the deadline. And please ALSO note: the cost of delivering the various perks/rewards at the various donation levels is going to substantially reduce the amount of money that Maria actually receives from the fundraiser, so the more money raised, the better. SPREAD THE WORD! Heads Up: The BETTER THINGS Jones-tribute art book! 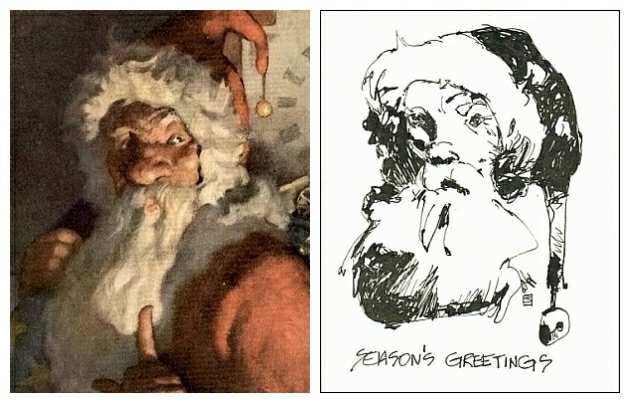 a set of 6-8 postcards featuring artwork randomly selected from the art book. 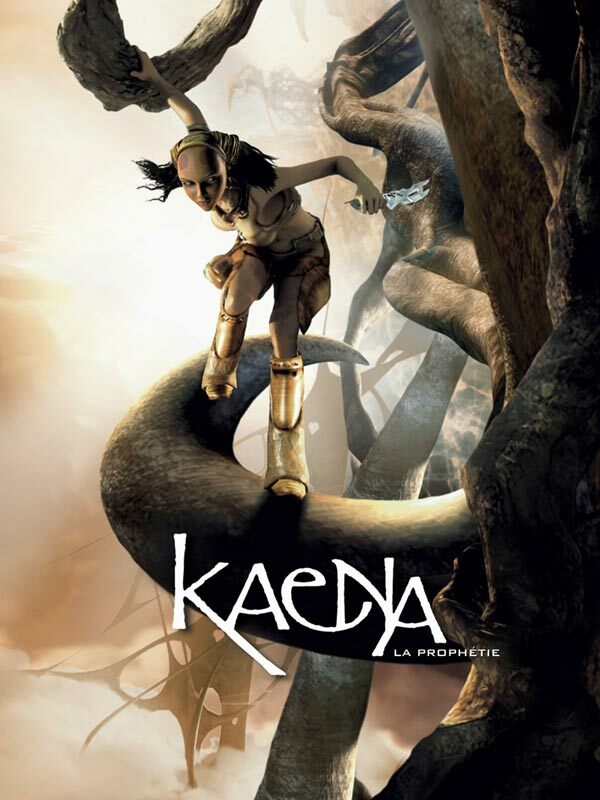 Since that time, producer/director/writer Maria Cabardo has added a $75.00 contribution tier with just the limited-edition art book as the perk. And earlier today, 07 February 2013, Maria confirmed the roster of artists whose work will be reproduced in the book. 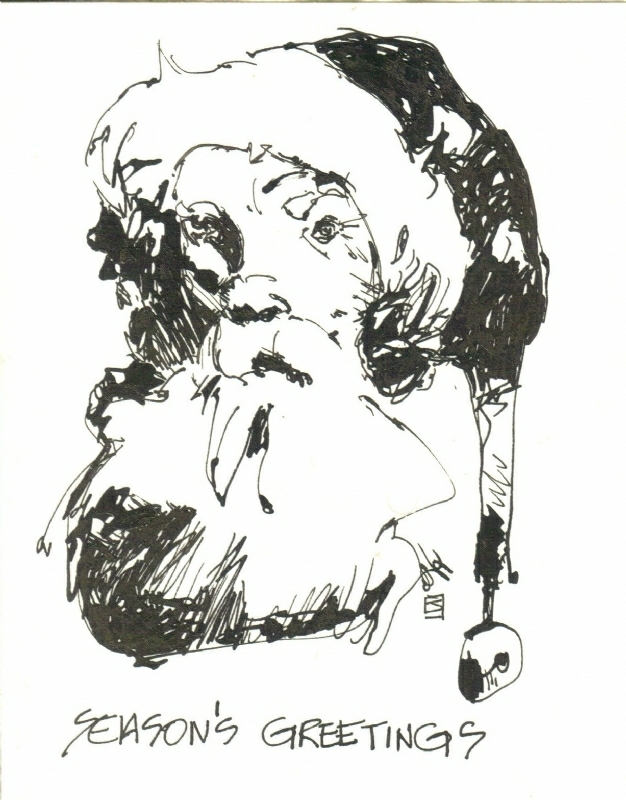 JEFF MIRACOLA – Jeff has posted one of the drawings he will have in the book right here. 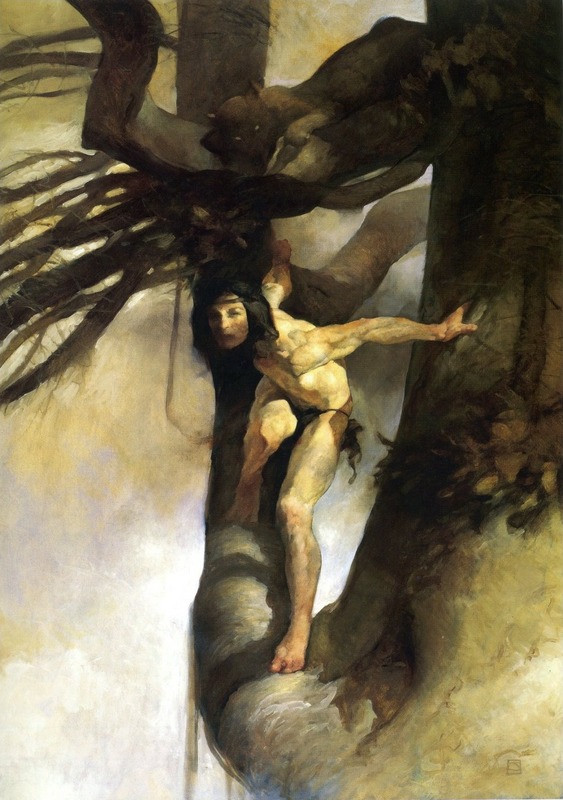 And last but definitely not least, the art book will feature reproductions of several pieces of art by JEFFREY JONES himself, including a watercolour sketch donated by collector Robert Weiner, president of Donald M. Grant Publisher, Inc., that will be featured on the cover. An amazing collection of artwork from artists in the comics, publishing, role-playing, and entertainment field. This book is dedicated to help fund BETTER THINGS and was only made possible by their generosity and willingness to help get Jones’ story and art to the world. It contains 48 pgs of color and black and white work. Help Better Things meet its fundraising goal by donating at the $75.00 or $100.00 levels (or higher! ), and receive the art book as thanks from your favourite artists. Go to the Better Things home page at Indiegogo and reserve a copy now! Therese Nielsen (http://tnielsen.com/) and Patrick Hill has been added to the list of artists contributing to the Jones Artbook. It is now a 64-page art extravaganza [upgraded from 48 pages], a tribute to Jones and a wonderful example of the artistic community’s generosity. 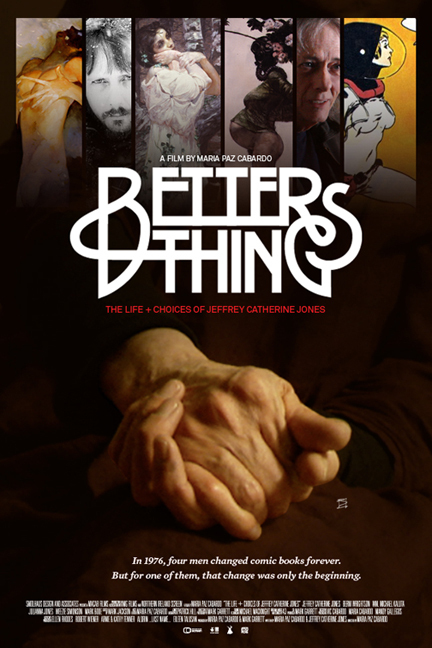 The documentary, Better Things: The Life and Choices of Jeffrey Catherine Jones, is complete, but as co-writer/producer/director Maria Cabardo notes in the introduction to her new Indiegogo funraising campaign, “The challenge now is to find the funds to repay these people [who have graciously loaned their skills and time to the project over the past few years] and bring the film to the widest audience possible and share the story of Jeffrey Catherine Jones and his art.” But that’s not all. If Cabardo meets her fundraising goal of $30,000, she will not only be able to pay her outstanding pre- and post-production debts, forthcoming marketing and advertising expenses, and ongoing production legal services and fees, but also will be able to complete a companion DVD of supplementary material, including cut interview footage with Jeffrey Catherine Jones himself, to accompany the feature. If you would like to help Maria to take her completed documentary to the masses, or you would simply like to receive a copy of the forthcoming DVD or one of the many other rewards Maria is offering at various contribution levels, click here to check out her Indiegogo fundraiser. Unlike her previous Kickstarter campaign, which did not reach its fundraising goal and thus did not provide any money to the project — Jones fan that I am, I sent the money I had pledged anyway, no strings attached, and I’ve just contributed again, which means I’ve personally given a hundred and fifty bucks to the documentary — I say, unlike her unsuccessful Kickstarter, Cabardo’s Indiegogo fundraiser is a “flexible funding campaign,” which means that Maria will receive ALL of the funds contributed by Thu 28 Feb 11:59PM PT, and is obligated to deliver all of the perks/rewards, regardless of whether the rather ambitious goal of $30,000 is met or not. 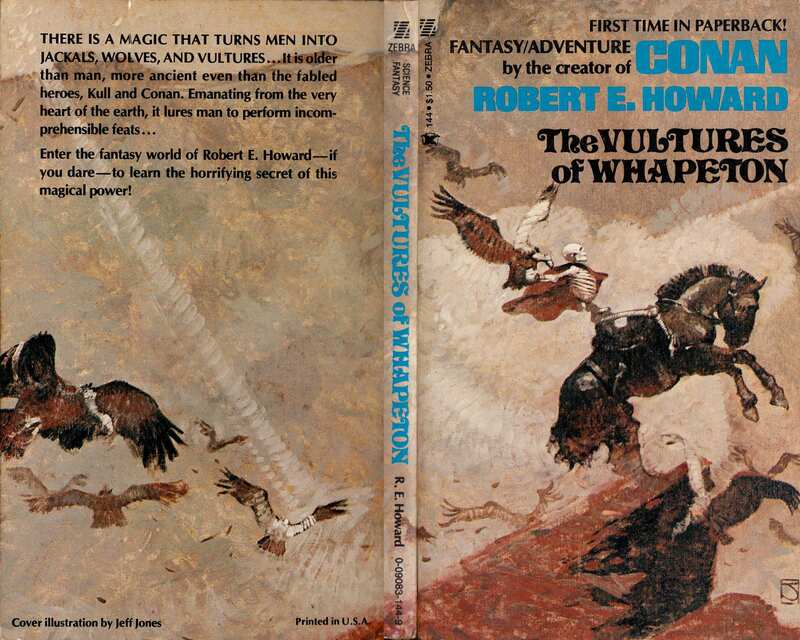 If Jones produced covers for more than fourteen Zebra/Kensington collections of the works of Robert E. Howard, I would be interested to hear the news, because as far as I am aware, fourteen titles is the complete set. Look Here: Three more Zebra/Kensington REH paperbacks, with cover art by Jeffrey Jones – The Incredible Adventures of Dennis Dorgan, The Lost Valley of Iskander, The Iron Man. Look Here: Another couple of R.E.H. 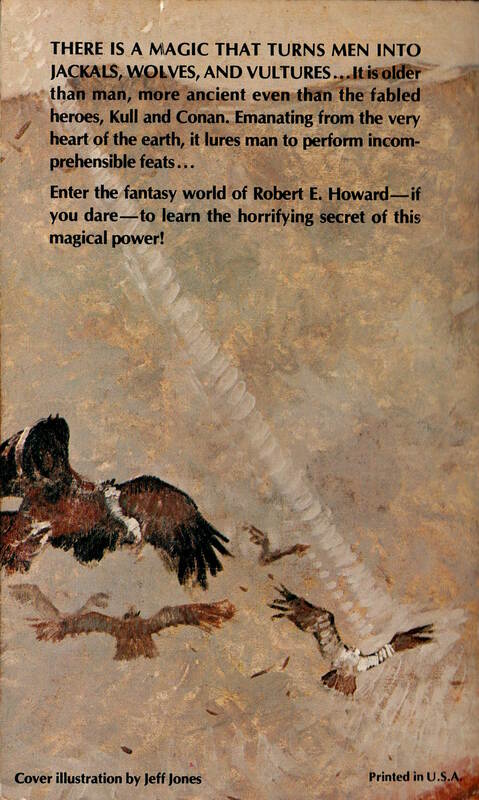 covers, with wraparound art by Jones – Tigers of the Sea, The Second Book of Robert E. Howard. 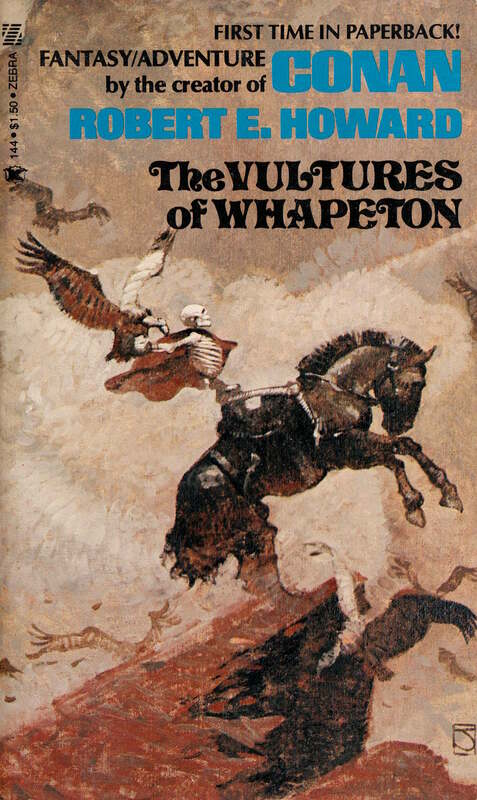 Louise Simonson on Frank Frazetta, Jeffrey Jones, and photo reference… – The Vultures of Whapeton. Look Here: Three more R.E.H. covers, with wrap-around art by Jones – Worms of the Earth, Sword of the Gael, The Book of Robert E. Howard. Look Here: Two Zebra/Kensington REH covers, with art by Jeffrey Jones – The Sowers of the Thunder, Legion from the Shadows. 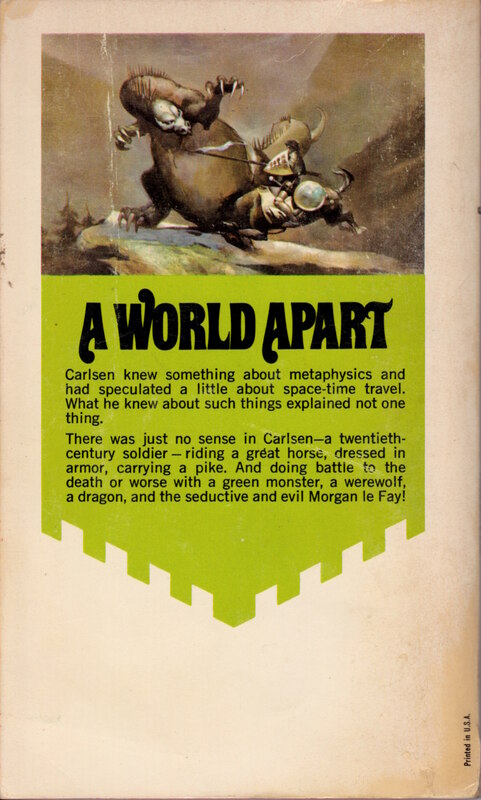 Keywords: Breckinridge Elkins, A Gent from Bear Creek, Pigeons from Hell and Other Weird and Fantastic Adventures, Cormac Mac Art, The Undying Wizard, The Vultures of Whapeton. 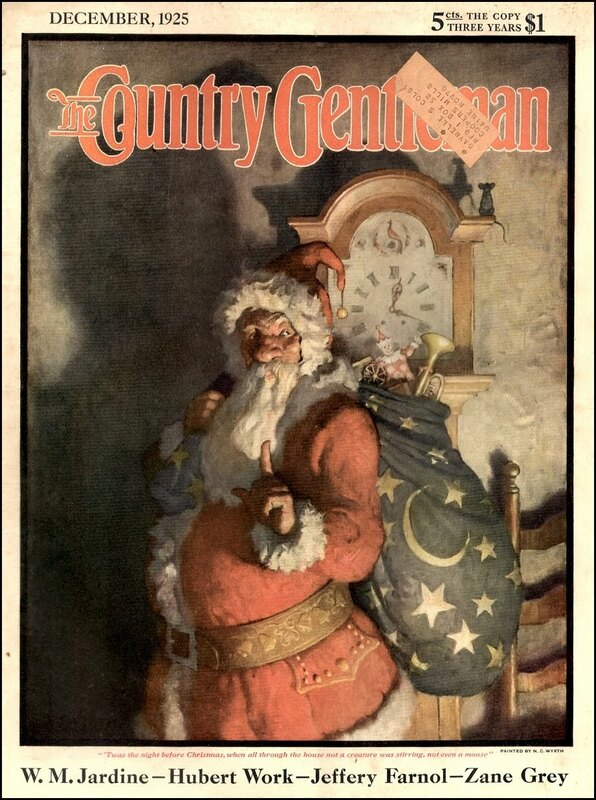 The “Jeffrey ‘Jeff’ Catherine Jones” category here at RCN — which currently clocks in at 122 posts, with more on the way — is a treasure trove of covers, comics, spot illustrations, sketches, and more. Check it out. Keywords: The Swords of Lankhmar, Swords against Wizardry, Swords in the Mist.